This item is 9 years and 5 months old; some content may no longer be current. Breast cancer is the leading cause of cancer death in New Zealand women. The national target for breast screening is for 70% of all eligible women to have been screened within a two year screening interval. To date, this target has not been met for any ethnic group, and there are significant differences in screening rates between Māori and Pacific women, and other women. The key role of general practice is to ensure that all eligible women, especially Māori and Pacific women, are encouraged to enrol in the breast screening programme. The national target for breast screening is for 70% of all eligible women to have been screened within a two year screening interval. 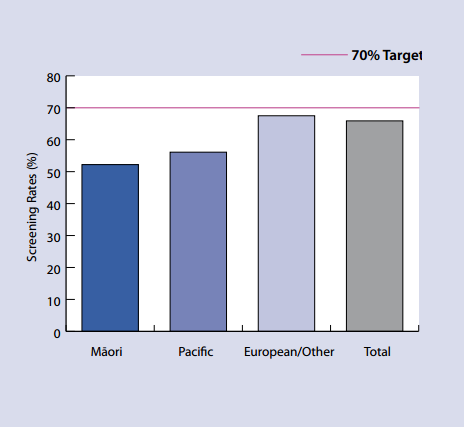 This target has not been met for any ethnic group, and there are significant differences in screening rates between Māori and Pacific women, and other women (Figure 2). The aim of breast screening is to identify breast cancers at an early stage, allowing treatment to commence sooner, leading to reduced morbidity and mortality. Many women miss out on breast screening because there is no national system available which identifies and enrols them for screening as they become eligible. The challenge, in the absence of a national system is for individual general practices to commit to ensuring all eligible women in their practice population are encouraged and assisted to enrol in the breast screening programme. Click on your region, then select “mobile screening unit schedule” to bring up a list of times, dates and locations of mobile screening. Consider printing this out and ensuring all practice staff are aware when the mobile screening unit is in your community. Consider coordinating with other practices as it is important to ensure the potential of the mobile breast screening unit is maximised when it is in your community. Ensure practice staff are aware of transport options in your area. Your PHO may have a financial assistance programme which could be used to help cover the cost of transport, if this is a barrier. Who is eligible for breast screening in New Zealand? Women who have had breast cancer in the past, but now meet the above requirements can enter or re-enter the BreastScreen Aotearoa programme, five years from when their breast cancer was first diagnosed. We have had huge success, working in partnership with BreastScreen Aotearoa. Before the mobile caravan is due to come to our area, we have regular meetings and brainstorms with other health providers on how to reach eligible women. Together with BreastScreen Aotearoa we do an audit of our 45-69 year old female patients that are not enrolled with BreastScreen Aotearoa each year. We then rule out the patients who have gone privately, declined, or have other health issues preventing them from having a mammogram through breast screening. BreastScreen Aotearoa gives us appointment times and we then phone these woman and enrol then over the phone and book them an appointment on the spot. We target the high needs Māori and Pacific women first. This method has been very successful as it means the patients do not have to phone BreastScreen Aotearoa and arrange it themselves. We also ask if there are any transport issues and can arrange transport for them through our local Māori Health provider or other community initiatives. The initial phone contact is useful to allay some women’s fears and to answer questions about mammograms. BreastScreen Aotearoa reimbursed the practice for the time and phone call costs to do this. Through this initiative we have improved our screening rates dramatically and it continues to improve each year. BreastScreen Aotearoa provided all the staff in the practice with shirts and fleeces with BreastScreen Aotearoa and the age limits written on them. It was surprising how many patients saw the shirts and were prompted to ask questions and subsequently go for a mammogram. Raising the profile of breast screening and working closely together with BreastScreen Aotearoa and other community groups seems to be the key. A general practitioner led initiative at the Te Whānau ā Apanui Community Health Service (TWAACH) in the Eastern Bay of Plenty, has been successful in increasing the uptake of breast cancer screening in a predominantly Māori community (approximately 90% Māori). Screening rates have increased from 45% of eligible Māori women in 2003 to about 98% in both 2005 and 2007. The starting point was agreement from the general practice team to set a goal and a clear focus on improving breast cancer screening participation rates for their predominantly Māori population. Changes were achieved using the current staff and resources, but with local input, flexibility and collaboration between existing services. Providing a cup of tea afterwards allowed the opportunity for women to share and debrief with each other, resulting in positive feedback and encouragement of other whānau to attend. TWAACH also followed up abnormal results. Breast screening was strongly advocated in the community. The staff of TWAACH were encouraged to promote breast screening at any opportunity. The dates of the mobile unit visits were advertised repeatedly in the TWAACH newsletter, marae and local businesses. Breast screening was promoted and information provided at a number of community events. Two well known women who had previously been diagnosed with breast cancer shared their stories and support of the breast screening programme. Registration forms were available at these events. Breast cancer screening coverage is included as one of the clinical indicators for the PHO performance programme. The overall goal is to achieve a breast screening rate of greater than 70% for all high needs women aged 50 to 64 years. A high needs woman is defined as an enrolee who is Māori, Pacific or living in a New Zealand deprivation decile area 9 or 10. Calculation of breast screening rates is made using data extracted from the PHO enrolment data base and the National Screening Unit breast screening data base. It is important all demographic information collected is as complete and accurate as possible. See BPJ 9, October 2007 “Making Ethnicity Data count”. NHI number: Ensure the NHI number is included. A valid NHI means the data can be matched with the NSU and PHO enrolment databases, to ensure it is counted. Gender: Ensure gender is recorded, as an “unknown” gender is converted to “male”, and will not be counted. Declines: Women who decline to be screened are not counted. This should not affect achievement of targets, as they are based on improvement rather than absolute numbers. Age band extension: The BreastScreen Aotearoa programme was extended to include women aged 45-49 and 65-69 from 1 July 2005. At this point in time there is insufficient data for measurement of these age bands. As a result, women aged 50 to 64 are only measured for this indicator. Thank you to Dr Nina Scott, Māori Strategic Advisor, National Screening Unit, Wellington for expert guidance in developing this article. New Zealand Health Information Service. Cancer: New registrations and deaths 2004. Ministry of Health, Wellington, 2007. Dachs G, Currie M, McKenzie F, et al. 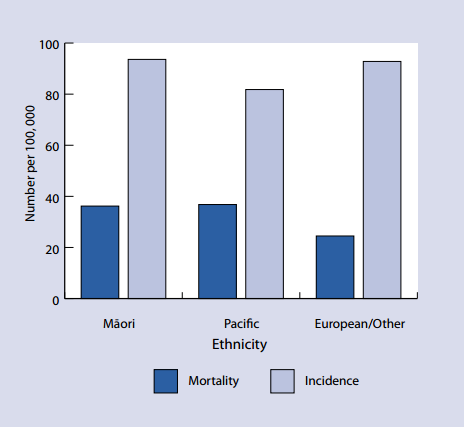 Cancer disparities in indigenous Polynesian populations: Māori, Native Hawaiians and Pacific people. Lancet Oncol 2008; 9:473-84. Weston M, Moss D, Stewart J, Hill A. Differences in breast cancer biological characteristics between ethnic groups in New Zealand. Breast Cancer Res Treat 2008 Oct;111(3):555-8. Thomson R, Crengle S, Lawrenson R. Improving participation in breast screening in a rural general practice with a predominately Māori population. N Z Med J 2009; 122:1291. This article is 9 years and 5 months old.